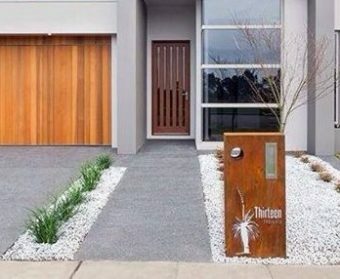 This custom made letterbox is intricately designed and laser cut with precise detail and creates a stunning feature for nay home or business. 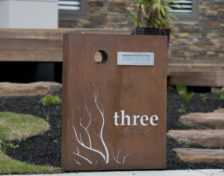 Each of our letterboxes come with your street name and number cut from the front panel along with a design of your choice. High Capacity Package – make the entire box 300mm in depth and take delivery of larger mail. Select the option in configurator above. 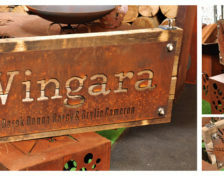 Rusted – We do the rusting for you in our workshop so it is ready to hang as soon as you get it. Natural rust finishes only get better with age. Please note: that naturally rusted finishes will leach onto surrounding surfaces unless you make provisions (with mounting etc) to minimise this side effect. Powdercoat – Colours available: Faux Rust (Corten), Flame Red, Satin Black, Woodland Grey, Monument, Jasper, Loft, Precious Silver. 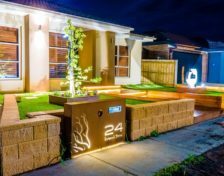 If you are interested in lighting up your letterbox to make your home standout at night – then you can add either a warm white or cool white LED lighting package. The package includes an LED lightstrip mounted inside the box and a 240/12V DC 20w transformer. You will require 12V cable to run from the location where the transformer can plug into 240V power to the letterbox. This can easily be run DIY. If you are ready to place your order, please select the options you would like above, add to cart and submit your order. Prior to anything proceeding we will supply you with custom concepts using your street name and number for your consideration. Once you are happy with the design we will then get it all underway. The product will be made to order and will take approximately 4 weeks to be cut, fabricate and pack. We will confirm all details, including expected date of despatch following receipt of order. Available for pickup from our Ballarat factory or delivery Australia Wide. Flat Rate shipping of $65 to Ballarat, Geelong, Melbourne Metro, Sydney Metro and Adelaide Metro. For all other locations please submit your order and we will get back to you with a shipping quote for your approval before anything goes ahead! Got further questions or interested in a custom size? We pride ourselves on meeting our clients specific requirements – please contact us.